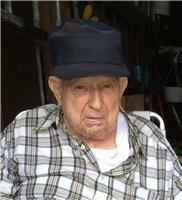 Henry Grady Asbury, age 88, of Willowick, passed away Sept. 24, 2014. He was born in Seven Mile Ford, Va. on Nov 29,1925, to the late Arthur and Marissie Asbury. Henry was a U.S. WWII Army Veteran. He worked for over 31 years at GM retiring in 1984. He was a member of UAW. He enjoyed gardening and gambling, he especially had a passion for the slot machines and lottery. He had a strong sense of family. He was a loving husband, father, grandfather, great grandfather, son, brother, and uncle, who will be dearly missed. He is survived by his children, Sharon Asbury, Brenda Asbury, Barbara (Michael) Birovsek and Jim (Gina) Asbury; his grandchildren, Brittany (Fred) Alexander, Lisa Birovsek, Melissa (Ricky) Rutkosky, Gary and Sienna Asbury; his great grandchildren, Frederick Alexander III and Jace Rutkosky. He was preceded in death by his loving wife of 50 years, Ruby D. Asbury; his siblings, Bill, Charles "Tip" and Orvin "Dopey" Asbury, and Lucille Bolton.